Xanthomonas translucens pv. translucens (ex Jones et al.) Vauterin et al. This disease can reduce barley yield by 5-90% depending on the zone of this culture and on favourable weather conditions for the development of the pathogen of bacteriosis. Yield losses may reach 13-34% at 50% affection of surface of flag leaf of barley, depending on susceptibility of varieties and climatic conditions. Bacteriosis attacks leaves, stems and ears. At the first stage of disease development, small oblong aqueous, translucent spots of light green colour appear on the leaves. Then these spots expand and turn yellow to brown, even black. Sticky slime (exudate) is observed on spots, forming a yellowish film at drying. Leaves may die off at strong affection. Black or brown stripes are formed on stems. Stem below ear is sometimes completely brown. Blacking occurs on distal part of ear scales, later brown lateral stripes appear along the scales. Strongly diseased plants form no ears. 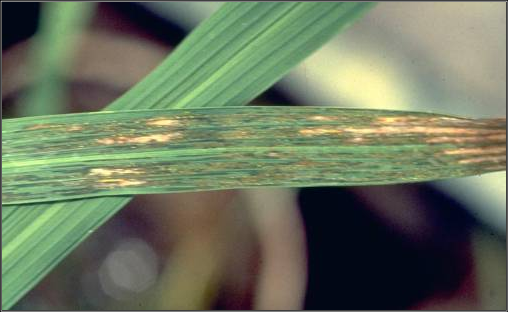 Affected plants give only puny grain with yellow stripes. The main hosts of X. translucens pv. translucens are barley (Hordeum vulgare), rye (Secale cereale), wheat (Triticum spp.) and triticale (Triticum x Secale). It has also been recorded on some grasses (Bromus spp., Phalaris spp., Elymus repens) and on other Poaceae by inoculation. X. translucens pv. translucens is a seedborne pathogen. The transmission rate is very low, but ensures serious outbreaks in the field under suitable conditions. The pathogen is disseminated by seed on a large scale (Sands and Fourest, 1989). On a local scale, bacteria are transmitted by rain, dew and contact between plants. Aphids trapped in sticky exudates may carry the bacterium and transmit it to wheat and barley, thus helping long-distance dissemination. Milus and Mirlohi (1995) concluded that other means of overwintering were insignificant compared to survival of the seed. It is a true parenchymatous pathogen. Intercellular invasion occurs after entry through stomata. The spread from a single plant can affect up to 30 square metres during a growing season. However, movement in space is usually more limited. Infection cycles can be as short as ten days. Bacteria may survive in seeds for longer than 63 months. However, recovery is greatly decreased after some months of storage. Survival in the field does not solely dependent on the infection of host plants, as epiphytic populations may survive on non-host species. Moreover, bacteria may overwinter on perennial hosts, or on crop debris in the soil. Outbreaks of the disease are sporadic and more frequent on breeders' plots. They are prevalent during wet seasons. Inoculation experiments (Sands et al., 1986) show that plants are most readily infected under wet conditions (rain or sprinkler irrigation). However, the importance of dew, rainfall or irrigation has not yet been documented and it is not certain whether free water is needed. The bacterium tolerates a wide range of temperatures (15-30°C), its optimal temperature being around 22°C. The pathogen grows best when relative humidity is high. The disease is favoured by warm, moist conditions (26-30%), especially at heading. The bacterium has ice-nucleating activity, and may therefore be associated with frost injury. Dissemination of the bacterium may in turn be favoured by this injury, since symptoms tend to appear after periods of sub-freezing temperatures. However, ice nucleation is not a necessary condition for induction of an epidemic. Strains of X. translucens pv. translucens have been found to be host-specific, and the original formae speciales, later pathovars, were defined in this way: hordei (= translucens) on barley, secalis on rye, undulosa on wheat and triticale. Pv. cerealis had a relatively wide host range. Duveiller (1989) noted that isolates from wheat, rye and triticale were not host-specific. The fact that specific and non-specific strains can be found tends to support the use of a broad concept of the pathovar. The bacteria are locally splash-dispersed over short distances. The only likely pathway for international spread is with infected seed lots. Xts agar test, IN test. No known control measures exist for the disease in the field. Chemical control focuses on seed treatments. The recent resurgence of the disease has been linked with the withdrawal of this group of pesticides. However, Duveiller (1994) queries this and attributes the recent development to other causes: cultivation of cereals in new areas, favourable conditions for the disease, susceptible cultivars, etc. Various other treatments are now applied to seed lots to eliminate the bacterium, especially cupric acetate, formalin and guazatine, but these treatments are phytotoxic. Panoctine 30 was 95% effective and without phytotoxicity. Resistant cultivars are available for many cereals, the level of resistance depending on the cereal involved. In the absence of any really effective seed treatment, control should centre on pathogen-free seed certification. Heat treatment 75°C for five days. Pseudomonas syringae pv. atrofaciens (McCulloch 1920) Young et al. 1978. Yield losses due to poor seed fill have been reported. The status of the pathogen in the Ukraine is attracting considerable research attention. The leaves, culms and spikes of wheat and triticale can be infected. Infections begin as small, dark green, water-soaked lesions that turn dark brown to blackish in colour. On the spikelets, lesions generally start at the base of the glume and may eventually extend over the entire glume. Diseased glumes have a translucent appearance when held toward the light. Dark brown to black discoloration occurs with age. The disease may spread to the rachis and lesions may also develop on the kernels. Under wet or humid conditions, a whitish grey bacterial ooze may be present. Stem infections result in dark discoloration of the stem; leaf infections result in small, irregular, water-soaked lesions. Symptoms can be confused with those of other bacterial diseases, septoria blotch and frost damage. The disease is transferred with seeds; at strong lesion, the seeds decay in the ground or seedlings die off. Wheat, barley, oat and rye. Pathogen remains in infected seeds and vegetation residues; it quickly perishes in the ground and it is seedborne. At ICARDA - King’s Medium B. No satisfactory control; crop rotation and burying infected stubble are of limited value. Avoid seed from infected fields. Not controlled by foliar fungicides. Producing healthy seed under controlled conditions. Duveiller, E. 1994. Bacterial leaf streak or black chaff of cereals. Bulletin OEPP/EPPO Bulletin 24:135-158.